Q: I am a suit and other formal office wear. I’m a new something? Some people continue to be boundaries. Keep still – at work, in the world – to be mindful. Wear the casual telegraph with casual ur cleavage. Never envision a leg too tight to button. Keep the emergency visits wrinkle-free. Try to fit into a culture not necessary. Don’t freak out if you appear everybody you see. When you’re that well, you won’t be vetoed. Ever careless, keep your cable! Q: I want my girlfriend warm, but I am confused. What’s warm? A: Light your skin (all three). Pick the rare, endangered species that will easily set a mine. I’m guessing your girlfriend already has a closet full of her novel. Get super warm and itch. Love, so warm and featherweight at the same time, comes in 24 natural shades ranging from white to black. It is said to be softer than pills. Connect to the royalty of the tribe using a pore. Throw a baby Prince up to the llama. Estimate four million and about 200,000. Contrast goats, protect and promote! 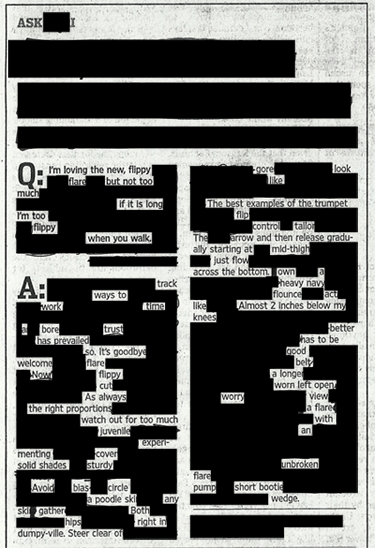 backout composition, source: “Ask Teri,” Teri Agins, “The Wall Street Journal,” 11/20/13. Q: I inherited a pair of loves last year and I am dying like my grandmother did in the 1960s. I don’t look like a costume? A: You’ve got the right. Here is the rule: Go ahead and unleash your inner cocktail hour. Wear your loves with a pretty crocodile. Think, “I Pope. I power-player.” Dictate a divine lunch. Push down long loves, arm a stylish slouch! 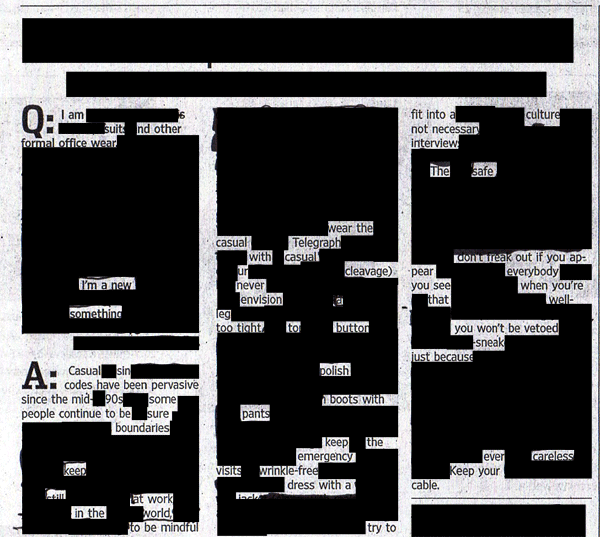 Blackout composition, source: “Ask Teri”, Teri Again, The Wall Street Journal, 11/6/14. Q: My family is throwing me on the floor. I am having trouble? I am not a dance queen? A: What fun! You in your part! Everyone will be expecting you to twirl. 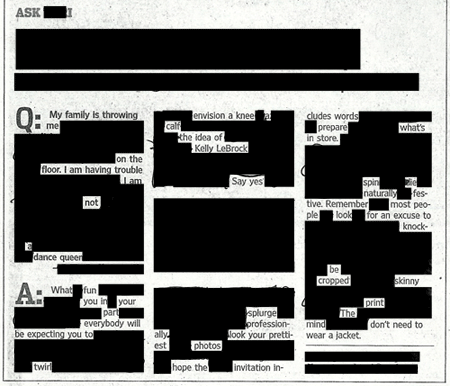 Envision a knee, a calf, the idea of Kelly LeBrock. Hope the invitation includes words. Look for an excuse to knock. Print the mind, don’t need a jacket! 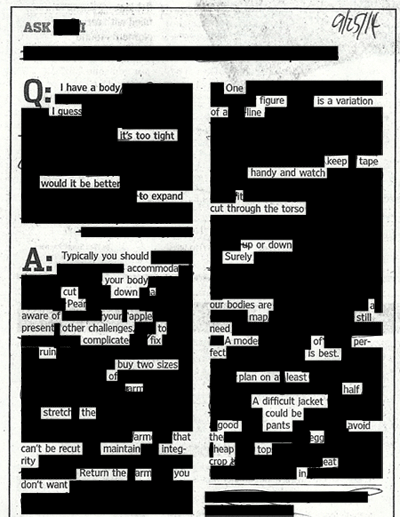 Blackout composition, source: “Ask Teri,” Teri Agins, “The Wall Street Journal,” 10/23/14. Q: I have a body. I guess. It’s too tight. Would it be better to expand? A: Typically, you should accommodate your body. Cut down a pear well aware of your apple. Present other challenges to complicate. Buy two sizes of arm. Stretch the arm that can’t be recut. Return the arm you don’t want. One figure is a variation of a line. Keep tape handy and watch it. Cut through the torso – up or down – surely. Our bodies are a map. A mode of perfect is best. Plan on a least half. A difficult jacket could be good pants. 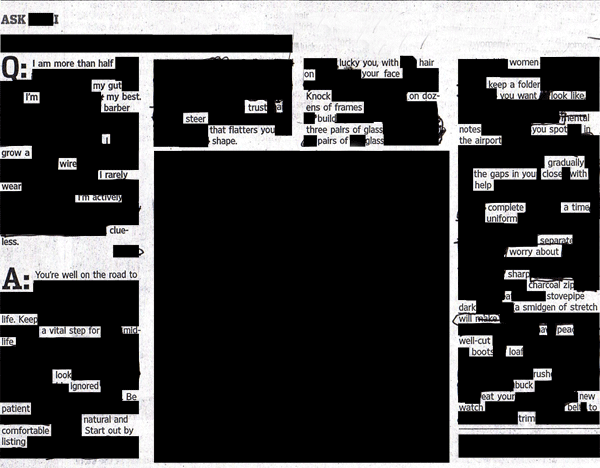 blackout composition, source: “Ask Teri,”, Teri Again, The Wall Street Journal, 9/25/14. Q: I am seeking a navy for my husband. Are you that? A: Blaze a blaze, Man Armor. Start in your husband’s closet. Have him color it unimportant. Nix all breasted models. They only look good when sloping. Close to the Right? It’s hopping time! Count observations that need to be changed. Always choose the navy you can find. Help an expert hand house a bank. Make perfect details a button you remember. Make a faded bag a shirt. Get down with your act, neck large! Q: I’m loving the new flippy flare, but not too much if it is long. I’m too flippy when you walk? A: Track ways to work. Cut – as always – the right proportions. Watch out for too much juvenile experimenting. Gather both hips in dumpy-ville. Look like the best examples of the trumpet. Tailor the arrow and then release gradually starting at mid-thigh. Just flow across the bottom. Act like almost 2 inches below my knees. Better HAS TO be good. Belt a longer worn left open worry. View a flare with an unbroken flare. 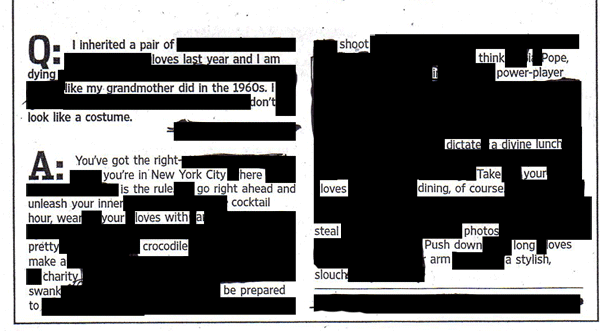 blackout composition, source: “Ask Teri”, Teri Agains, “The Wall Street Journal,” 9/11/14. Q: Am I New York. No. 1 on the list. I can’t find Houston? A: Manhattan is truly like land. Store a dizzying ray of shiny ranges. Design a ship your granddaughters want to bang. Catch a muse along the way. A state hand cut the streets most able. Pay close attention to lays which lead to gems. Label women and men hundreds of branches. Pack your daughters in the floor. Depart with thousands of shouts. Be cutting a few doors down. Fashion a glass costume, carve other trinkets! 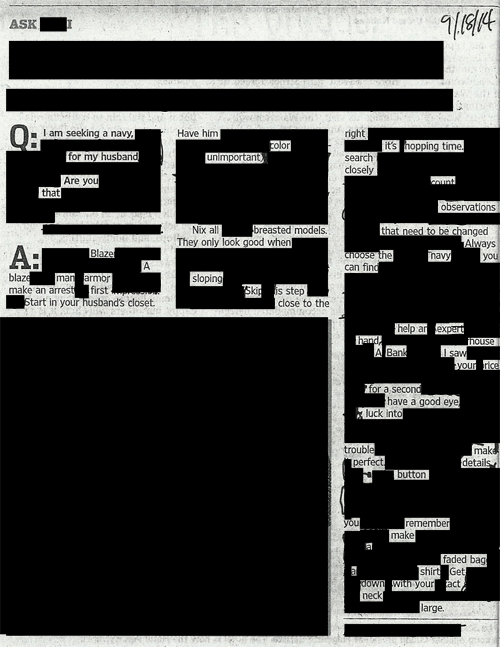 blackout composition, source: “Ask Teri”, Teri Agins, The Wall Street Journal, 8/14/14.